It is easy to activate Remote Notification. Once you have purchased a license, you should receive an email that contains your license details. Open the Windows Home Server console, and go to the Remote Notification Settings tab. On the About page, click the “Enter License” button. 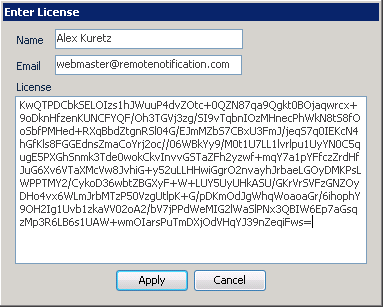 Enter your name and email address exactly as they appear in your license email, and copy/paste the license key. That’s it! Note that the above license is an example and won’t actually work.